Aircraft navigation terms can often be confusing, especially when a pilot doesn't use them every day. Experience with cross-country flights and practical use of navigation techniques make these terms easier to identify. In the meantime, here's a review of navigation terms and the corresponding definitions. Calibrated Airspeed (CAS) - Indicated airspeed corrected for instrument or position inaccuracies. The calibrated airspeed can be found in the pilot operating handbook or on the airspeed indicator. Indicated Airspeed (IAS) - The airspeed read directly from the airspeed indicator. Groundspeed (GS) - The actual speed of the airplane passing over the ground. Groundspeed is true airspeed corrected for wind. You can find the aircraft ground speed by calculating it with a flight computer. True Airspeed (TAS) - The actual speed relative to the surrounding air. True airspeed is calibrated airspeed corrected for nonstandard pressure and temperature. 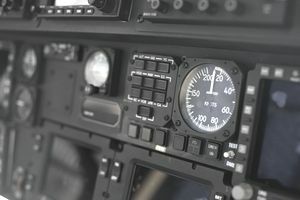 You can determine the aircraft's true airspeed with a flight computer. Indicated Altitude - The altitude depicted on the altimeter. Remember that indicated altitude is the vertical distance above mean sea level (MSL), not above the ground. Density Altitude - Pressure altitude corrected for nonstandard temperature. You can calculate density altitude with a flight computer. Pressure Altitude - The altitude shown on the altimeter when the altimeter is set to 29.92 inches or standard atmospheric pressure. Absolute Altitude - The vertical distance of the aircraft above the surface of the earth, or above ground level (AGL). True Altitude - The aircraft altitude above mean sea level (MSL). You can determine the true altitude with a flight computer. True North - The geographic north pole is located at the northernmost point. True north is not the same location as magnetic north, due to the rotation of the earth in relation to the earth's magnetic field. Magnetic North - The northern location where the Earth's magnetic force has the most downward pull. If you were to stand on magnetic north, a magnetic compass would point straight down. Magnetic north varies due to shifts in the Earth's core and is at a different location than true north. Magnetic Variation - The angular difference between true north and magnetic north. Also known as declination. Magnetic Deviation - A magnetic anomaly that affects the compass. The magnetic compass in the aircraft is affected by surrounding magnetic and electrical disturbances in the airplane. Compass Heading - The aircraft's magnetic heading corrected for deviation. The deviation is found on a compass card or a placard near the compass, and it usually varies by just a degree or two. Magnetic Course - True course corrected for magnetic variation. Magnetic Heading - True heading corrected for magnetic variation. You can determine the magnetic variation from a sectional map. True Course - The aircraft's course over the ground relative to true north. True course is measured with a navigation plotter and a sectional map. True Heading - True course corrected for wind. Standard Temperature = 15 degrees Celsius or 59 degrees Fahrenheit. Standard Pressure = 29.92" mercury or 14.5 psi or 1013.2 mb.